My last post on building a UCS Millenium Falcon on the cheap was such a blast that I decided another penny pinching post would be in order. Previously, I showed how to build a Falcon for $900 or less, down from a new ticket price of $3000. Let's see if the Cafe Corner can be so lucky. 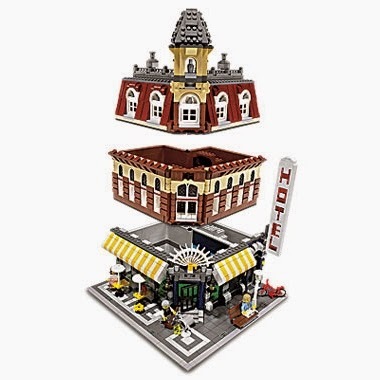 This is the number one most wanted set on Bricklink. Of note should be the current price for sale. Bricklink is the best source for this. We can single out the incomplete ones (which really mess up the price guide). Complete Cafe Corners appear to be holding steady around the $1500 price range for a new in the box with instructions set. Used ones are about $800. The part out value (new) for one is only $765 though. At first blush, this doesn't look like there will be as much impact as the Millenium Falcon. Less licensed parts, likely. It also seems like a no-brainer to buy the parts. Let's continue this exercise and see how much we might save anyway. That $765 will need an extra 12% for shipping, so consider adding $90. Total is $855. Per the Millenium Falcon instructions, fire up Brickstock and let's load it up. After loading the inventory and aligning to the price guide, I get a value of $852. This includes both extras and variants though. Click the left most column (Status) and scroll down to the bottom. Remove all the extra pieces (labeled with a big blue +). 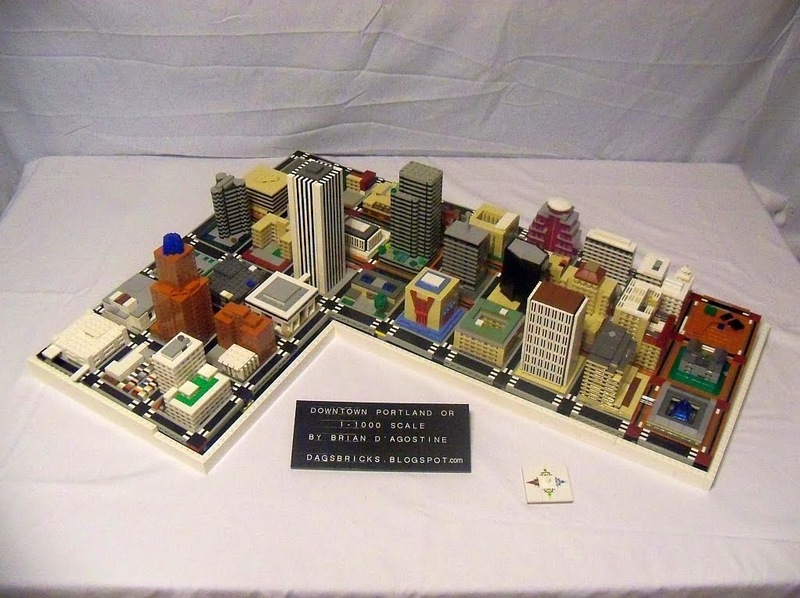 These were included in the original set in case you happened to lose one of the tiny pieces. For the variants, delete the most expensive one of each. In all three cases it will be the 'a' variant. Also delete the counterpart. Price is now down to about $760. Sort by price and scroll back to the part. Let's find some substitutes for the most expensive pieces! First, dat door! At $40 this one piece accounts for over 5% of the cost of the set. There are a few options. One is to change the part number to 73436c01. This gives you the left hand door instead of the right hand door. Now only $16. Or you could change the color of the door to old light grey and trans-black glass. Part number 73435c03 is under $10 new. Another option (as of this writing) is to part out another set to obtain the door. The original Krusty Krab #3825 has both a left AND a right hand door in the proper color. The part out value for this set is $110, mostly due to the doors. You can purchase the set on the aftermarket for $40-50, keep the door, and part out the rest. You could actually make about $30 to build your Cafe Corner! 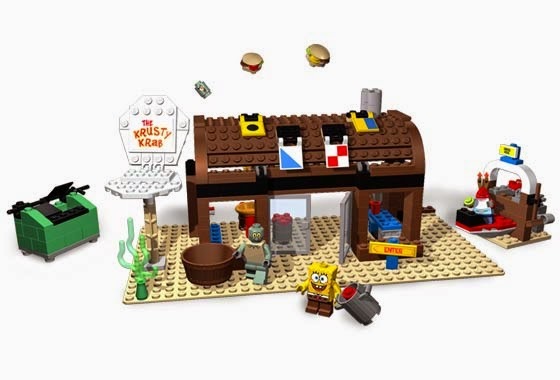 Not only that, but you could harvest about 80 other parts out of the Krusty Krab to build the Cafe. Rumor has it that there are a bunch of leftover sets somewhere in a vault. TLG still had sets on hand when the license expired so they are currently unsellable. Next is that $14 window frame and you need FIVE of them. There's $70 right there. Most of the time, variants are listed as and 'a' and a 'b'. But then TLG does something goofy and releases a variant with a completely different part number. If you don't care whether your studs are solid or hollow, then change the part number to 60598. Suddenly it's 21c! There's $69 in savings right there. BUT, beware that the shutter piece 4133 does not fit this window frame. Before we forget, let's fix this. Go to part 4133 and change the number to 60608. Also double the quantity to 10. The older window has a single shutter that is the full width of the window whereas the new window requires two smaller shutters. It's up to you on how precise you want to be. If this is for yourself, you can save $70 doing it this way. If you plan to resell someday, you'll need to replace the windows with the correct ones. 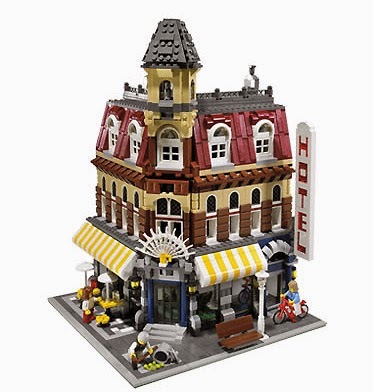 The door 73312 is $10 but there really aren't any good substitutes. There is not a left version in black. The only other colors it comes in are red, blue, and white. The white one might work but it's $32 new so this is no improvement. The $10 turntable base can be changed to black to drop the price on four of them from $40 to 17c. Twenty of the white 1x2x3 panels will run you $160. There is a newer version of the panel with reinforced sides. Once it's built in place, you can't see the difference. Change the part number to 87544 and you'll see the bill for bulk drop to $4. The black door frame 1x4x6 is our last expensive bulk part. Much like the previous window frame, change the number to 60596. This is the same size door, but with a little different inside frame. It's functionally the same. The price drops from $8 to 25c each. Across five of these doors, that's a saving of $38. At this point let's take a look at our cost. Hit Ctrl-A to select all pieces. In the upper left hand corner You can see that we've gotten down to $425. That's $340 off and we're still not done! There are several more minor parts to explore. One is the reddish brown 2x10 brick. These are $7 each but also replaceable. You could go with old brown for $3. Or you could replace each of the two bricks with three stacked plates dropping the price of the function to 35c each. The tan 1x6 arch brick can be changed to variant 92950, dropping the price from $3 to 10c. Per TLG's replacement services, the dark blue 1x8 arch can be replaced with dark bluish grey. The arch is not seen very well when displayed. This piece is in less need of replacement than a year ago. It used to be $15 and up. 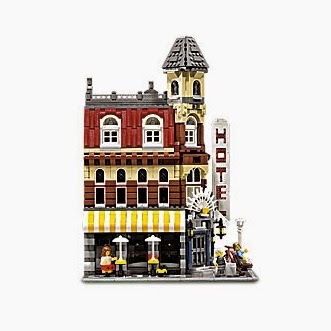 Ever since it was re-released in the Winter Village set, the price has been dropping to the point that you can get one for as low as $1.25 (as of this writing). Similarly, the 1x1x6 pillar support can go dark bluish grey to save over $2 from the sticker price. But, these pillars are highly visible when displayed. The last extra to explore is the baseplate, or, baseplates. 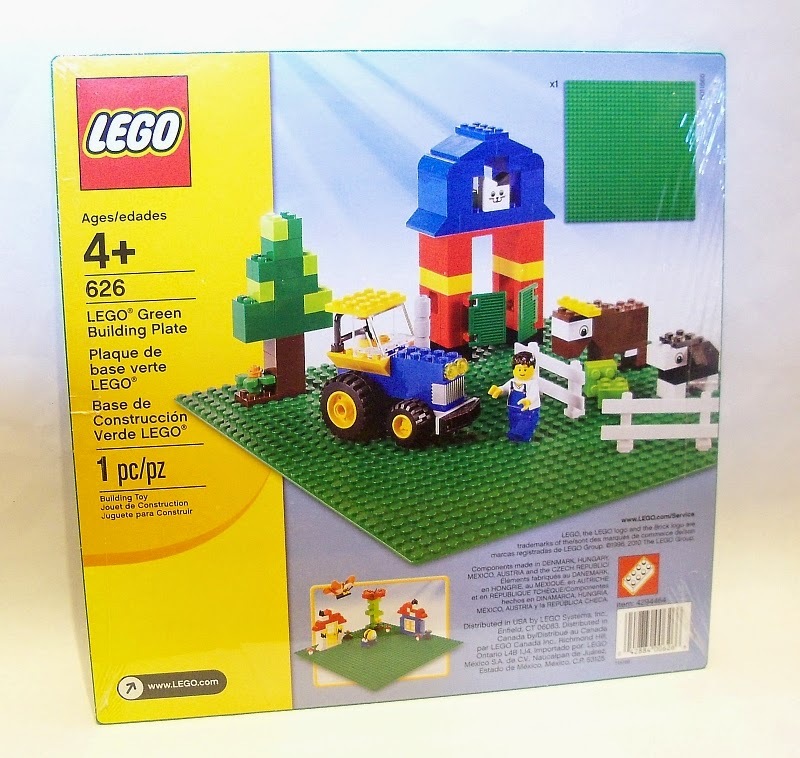 This set originally came with two 16x32 baseplates. But since the model doesn't swing open in halves, there's not much need for both baseplates. Save yourself $11 and pick up an $8 32x32 at your LEGO store or with your next Shop@Home order. Beyond that, there is really no more low hanging fruit other than the minifigs. Much like in the prior guide, I'm going to strike them. Between the three of them it's a $20 savings. They're pretty basic and could be replicated with some pieces from your own collection. Beyond that, any little cost savings might come from changing the colors of hidden parts. Total cost is now down to $370. Add 12% for the shipping and we're at about $415. So we've cut the price in half. Not quite a 67% savings as in the Star Wars ship but reasonable. If you want to add original printed instructions, set aside about $200 extra. For the box, it's $200-$300. What other large sets would you like me to penny pinch? Sound off in the comments.